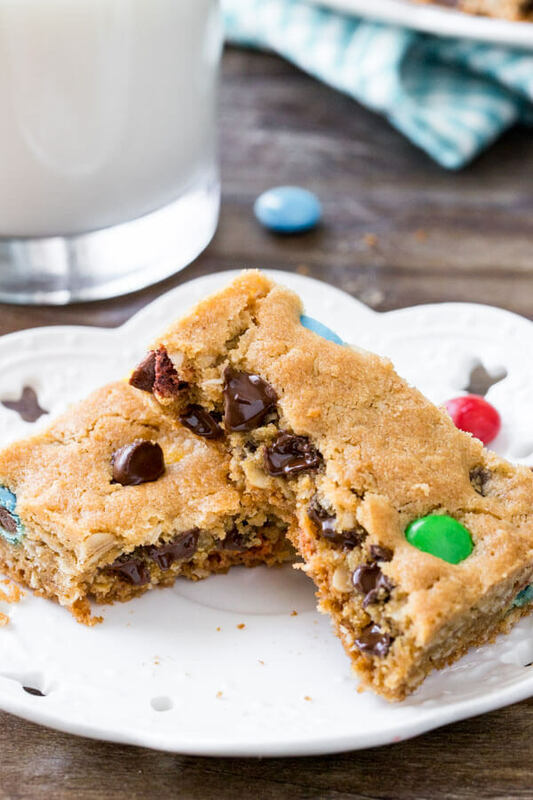 These Monster Cookie Bars are everything you could want – soft, chewy, extra thick and filled with peanut butter, oatmeal, chocolate chips and M&Ms. It’s an easy cookie bar recipe that’s faster than making a batch of cookies and impossible to resist. 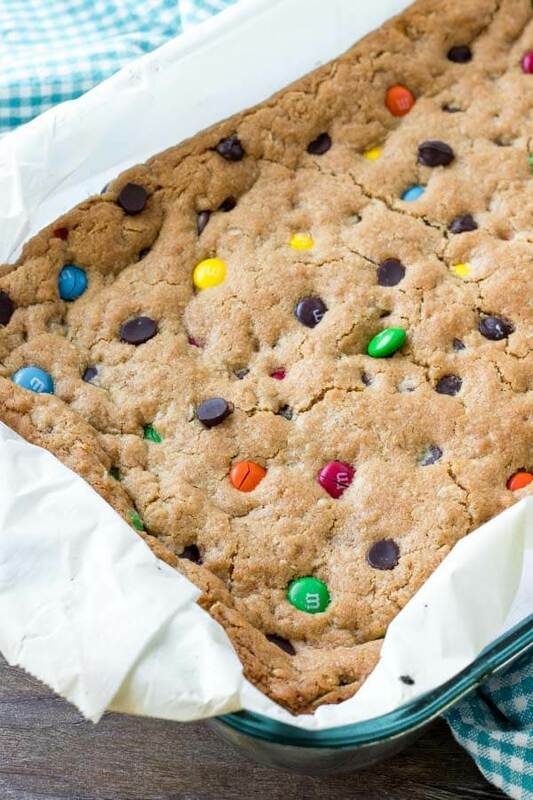 If you’re looking for an easy cookie recipe that’s big on flavor – then these monster cookie bars are just the thing. 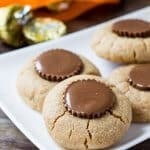 They’re loaded with peanut butter flavor, chewy oatmeal, and tons of chocolate candies for the ultimate treat. You can definitely taste the peanut butter, but it’s not too overpowering. 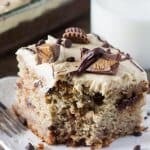 So you end up with cookie bars that are thick and chewy, with the perfect balance of salty and sweet. It’s faster and less messy than making cookies. This recipe is seriously easy & seriously delicious. Here’s the rundown (or feel free to scroll down to the recipe card if you don’t want the extra explanation/cookie science). Beat together 2/3 cup butter, 1/2 cup brown sugar & 3/4 cup white sugar. 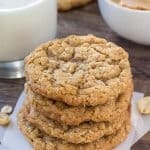 Using a combination of brown sugar and white sugar makes the cookies extra chewy. Then mix in the 2/3 cup peanut butter, 2 teaspoons vanilla extract & 1 large egg. I don’t recommend using natural peanut butter because it can separate and lead to inconsistent results. Then carefully mix in the dry ingredients: 1 cup flour, 1 teaspoon baking soda & 1/2 teaspoon salt. Be careful not to add too much flour or the bars can get dry instead of soft and chewy. Then mix in 1 1/2 cups old-fashioned or large flake oats. Quick oats will work, however, I find old-fashioned gives the best texture and chew-factor. Do not use instant oats (they behave more like flour) or steel cut oats (they’re too hard for baking). Stir in 2/3 cups chocolate chips and 2/3 cups M&Ms. Press the mixture into the bottom of a lined (or greased) 9×13 inch pan, and then dot the top with a few extra candies. Bake in the middle rack of your oven preheated for 350F degrees. The bars will bake for 22-25 minutes, or until the top looks set and slightly browned around the edges. Can I turn these monster cookie bars into monster cookies? This recipe was developed to be made into bars. 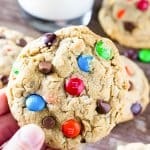 If you want to make regular monster cookies, then try this recipe instead. Can I freeze these cookie bars? Yes, they freeze well. Thaw in the fridge first, then bring them up to room temperature before enjoying. 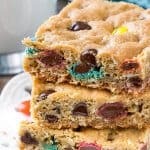 Chewy, extra thick, peanut butter, chocolate chips and so many M&M candies – you really can’t go wrong with these monster cookie bars. 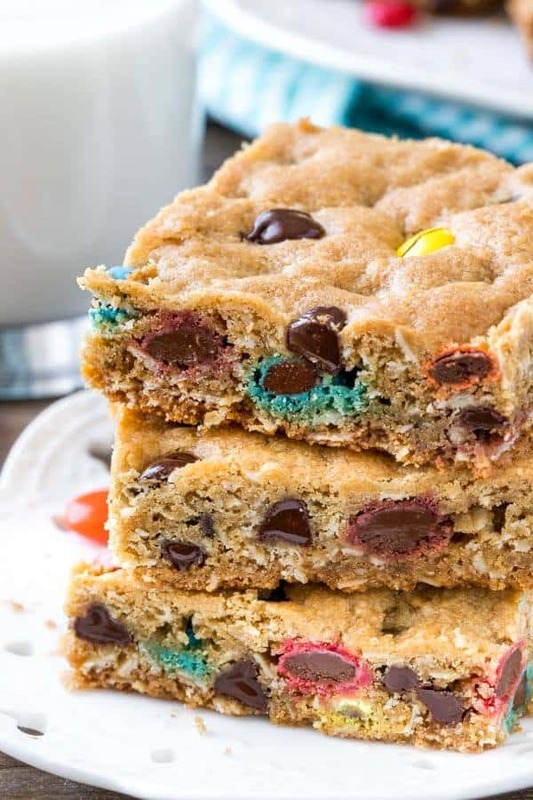 Monster Cookie Bars are everything you could want - soft, chewy, extra thick and filled with peanut butter, oatmeal, chocolate chips and M&Ms. It's an easy cookie bar recipe that's faster than making a batch of cookies and impossible to resist. Preheat the oven to 350F degrees. Line a 9x13 inch pan with parchment paper so there's a 1 to 2-inch overhang on all sides, or lightly grease. In a large bowl beat the butter, brown sugar & white sugar until combined. Mix in the peanut butter, egg & vanilla extract. Turn the mixer down to low speed and mix in the flour, baking soda & salt. 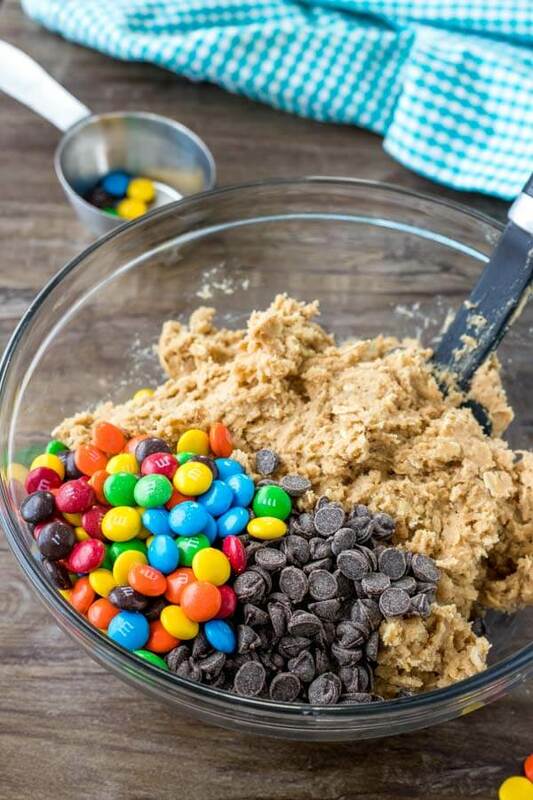 Turn off the mixer and stir in the chocolate chips and M&Ms. Press the dough into the bottom of the prepared pan. Bake for 22-25 minutes, or until the tops look set and around the edges is starting to brown. Cool fully (at least 30 minutes) then cut into bars. *Store in an airtight container at room temperature for up to 4 days. I think my daughter and I will be looking forward in doing this for the coming holiday season. She loves M&Ms.